What's the Secret Word? 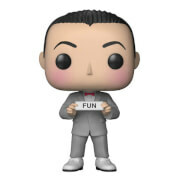 Laugh it up with this Pee-wee Herman Dorbz Vinyl Figure! Pee-Wee measures approximately 3-inches tall and comes packaged in a window display box.